ISO 9001 is a management system standard for quality processes that describes how operations are continually improved to meet customer needs. The entire Nordic Gas Solutions business is environmentally certified according to ISO 14001 as part of clarifying and structuring our multi-annual environmental work. 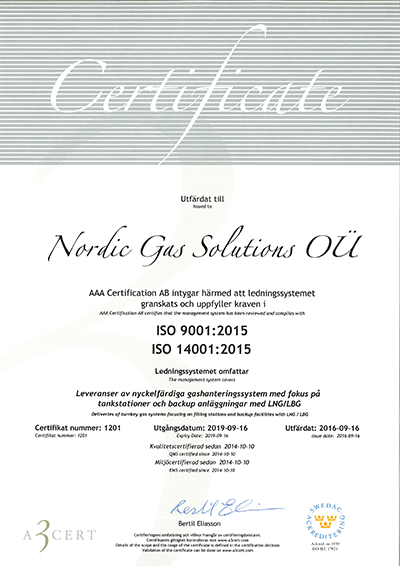 Below is our ISO 9001/14001 certificate for Nordic Gas Solutions AB (Sweden) and Nordic Gas Solutions OÜ (Estonia). Click on them to download in PDF format (page will open in a new tab).